After a few nights in Pittsburgh, I returned to the eastern side tonight. Figured a bit of food and a beer or two would be in order. A quick survey of the house and figured TJs would be the more expedient way to a satisfying combo of the two. But, as is usually the way at TJs...a gracious owner, a congenial bartender, and some usual suspects can quickly turn an innocent hour long dinner into a mini-fest. I'm still not quite sure what happened but appreciate all who were involved. 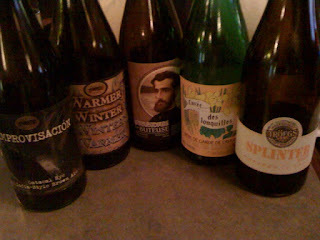 Check out the picture below for further evidence from one of the Philly region's best beer bars.